School nurses are passionate about the health and wellbeing of children and young people, always striving to ensure services meet local needs and finding creative or innovative ways to improve delivery. The 4-5-6 model provided an opportunity to focus on a transformed service for children, young people and families and shines a light on the leadership role of public health nurses. School nurses can bring together their knowledge and passion with evidence to leadership as well as to practice and the 456 model helps do this by clarifying purpose and focusing on high impact areas which where we know school nurses can make the biggest impact. Understanding and being able to articulate purpose is fundamental particularly when working across agencies. 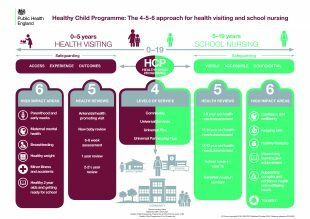 School nurses as leaders of the Healthy Child Programme (5-19) are crucial in preventing avoidable disease, protecting wellbeing and promoting resilience in children, young people and families. The agenda is vast, complex and ever-changing, as such this requires school nurses and their teams to provide leadership and to work collaboratively with key partners to maximise impact and improve access to support. Leadership can be challenging. It is important for school nurse leaders need to develop their own resilience and to develop their negotiation and influencing skills to maximise opportunities whilst building new, and strengthening existing, relationships. The strong links with local authorities provide opportunities for horizon scanning and different ways of working to enhance local delivery. Effective school nurse leaders have a role to play in creating a climate for positive challenge, providing evidence based solutions and entering in intelligent dialogue to influence effective decision-making. 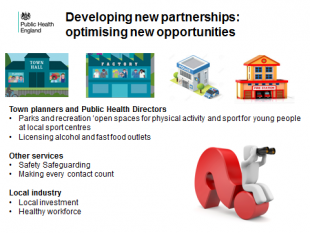 Working together with commissioners provides an opportunity to utilise Community Based Assets to address local needs. School nurses with their public health expertise, clinical experience and connection with young people are invaluable in working at an individual, community and population level – creating a climate for behaviour change and social movement to bring about change, whilst harnessing the voice of children and young people! School nurses lead their teams creating opportunities, embracing innovation and pushing boundaries – their drive? The deep rooted desire to make a difference, improve outcomes and give young people a voice - all the qualities of strong, effective and authentic public health leadership.